Why do marginalized citizens ask for more punishment? What do they mean when they see others as undeserving of state support, even while they depend upon public welfare for their own survival? And how do we make sense of popular support for votes like 'Brexit' in the recent referendum on leaving the European Union? These are only some of the questions that lie at the heart of this book. Starting with dominant theories that have seen the contemporary moment as indicative of a growth of 'penal populism' or 'popular authoritarianism', Personalising the State revisits one of the central paradoxes of our times: the illiberal turn that liberal democracy has taken. If much of the commentary has addressed this paradox by looking for causal explanations, this book goes to where the literature has tended to stop short: to the actual and lived experiences of some of the residents of Britain's most socially abandoned neighbourhoods. Drawing on historical and long-term ethnographic fieldwork on a working-class housing estate, this book moves from the question of 'why' liberal democracy has taken a punitive turn to the 'how' and the 'what': to what democracy means to these residents in the first place and how they experience their daily engagements with the state. The book challenges any idea of a singular punitive public. While citizens endorse, even ask for more, punitive policies in some situations, they also reject and expel the authorities in others. These popular forms of state engagement reflect, in turn, a long legacy of state control exercised against working class people in Britain. 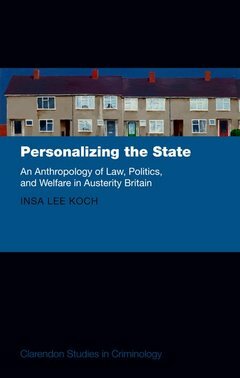 Ultimately, Personalising the State argues that popular engagements with 'law and order' cannot be understood by reproducing the state's own assumptions of order but only by starting with the actual political economies of care central to the lives of those at the margins. Insa Koch is Assistant Professor in Law at the London School of Economics and Director of the Anthropology and Law Programme. She has published on politics, austerity, social housing, the welfare state and criminal justice reforms. Her research combines an interest in political economy and anthropology with criminology, law and social theory.